The sweet gum tree grows to between 20 and 30 m high. This species is in high demand for the elegance of its majestic autumn foliage. The sweet gum (Liquidambar styraciflua) belongs to the Hamamelidaceae family. It is also called the "American red gum", "American sweet gum", and "satin walnut". This tree has a top that is at first conical, and then widens. Its brown, cracked bark becomes very corky over time. Its leaves are petiolate and about fifteen centimetres long. Deciduous with 5 lobes, the leaves are finely chiselled in appearance, with beautiful scarlet red, purple and copper autumn shades. Its male flowers are spherical capsules covered with spines, while its female flowers are greenish yellow. Its round fruit, in spiky capsules, are similar to the fruit of the plane tree. They turn brown when ripe in October, and remain on the tree throughout the winter. This ornamental tree comes from the temperate forests of the United States, from Connecticut down through the north of Florida and into Louisiana. It was introduced into Europe in 1681. 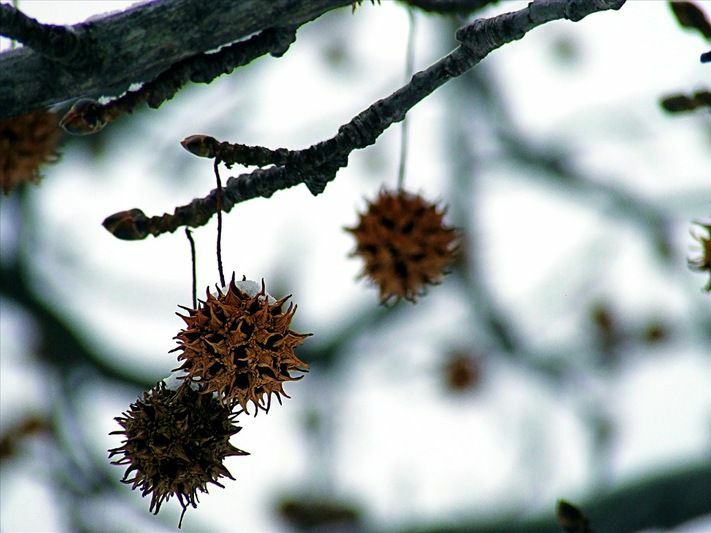 In order to grow well, the sweet gum needs to be planted deeply in neutral, cool and humid soil of a compact texture. It grows well along the coast as it thrives in humidity and fog. This tree is essentially used for ornamental purposes, but its wood is also used in cabinet making.